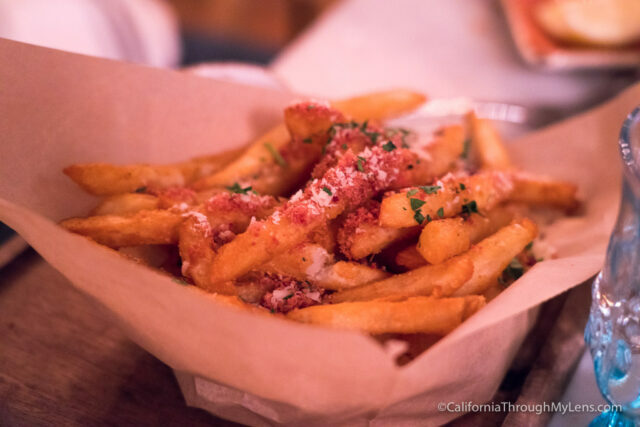 The Gaslamp area of San Diego is one of the top destinations in the city for both food and drinks. 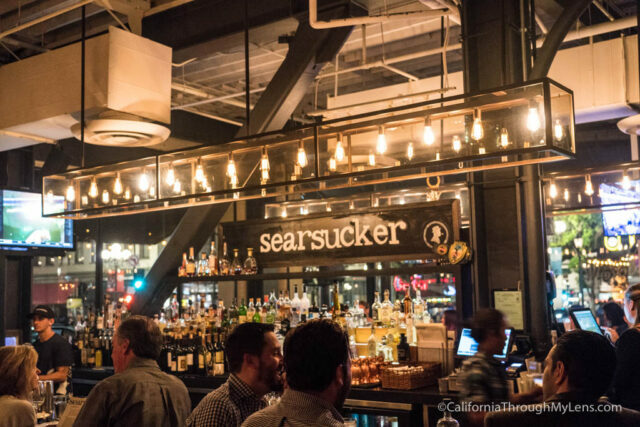 While there are a ton of options for great places to eat, for me Searsucker is one of the best for a nice upscale meal in downtown San Diego. The unique menu here and the relaxed atmosphere makes for an excellent night out, but do make sure to note that it can be pricey. Here is all the information. 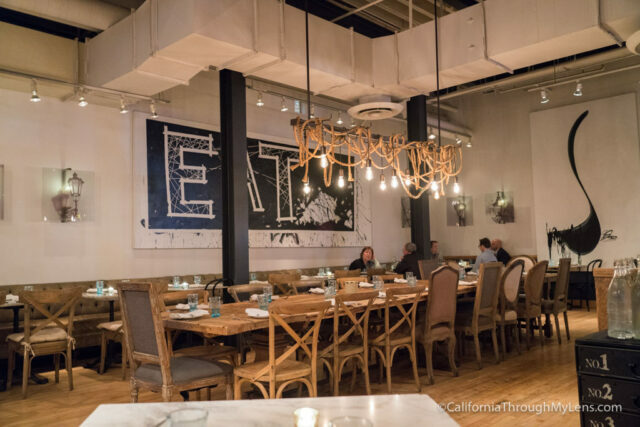 The restaurant is located on Market St and Fifth Ave. You can valet park or you can find a parking lot or structure around the Gaslamp area. Searsucker is right in the middle of Gaslamp in a busy part of the city. The restaurant feels like a nice escape though with its wide open floor plan and high ceilings. 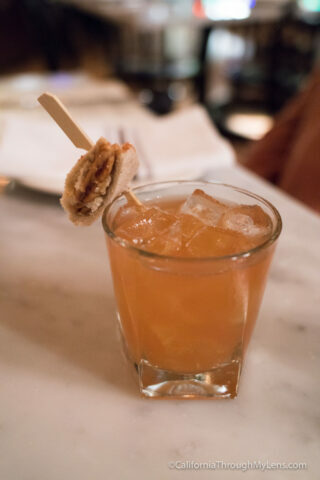 The menu starts with three unique takes on the traditional old-fashioned drink, including a peanut butter and jelly old fashioned with a small Uncrustable like sandwich on the rim and a cream soda old-fashioned. 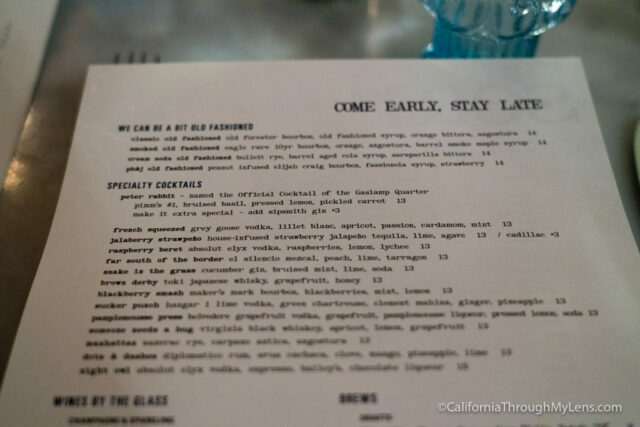 The menu continues the eclectic style with everything from short ribs and street corn to octopus. I usually just get a few of the small dishes since that allows me to try lots of things on the menu. Here is what my wife and I got last time we were there. Short ribs – One of the flagship dishes here, the short ribs are very tender and practically melt in your mouth. They are served with creamy horseradish, whipped potatoes which add a great flavor to the rich meat. 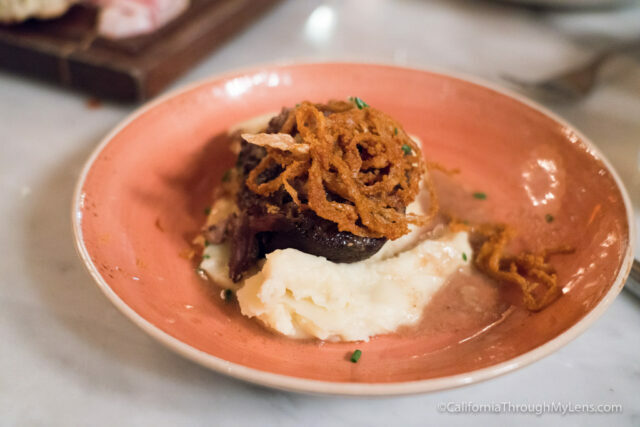 The dish is topped with fried onions, adding a nice crunch to the meat and potatoes. 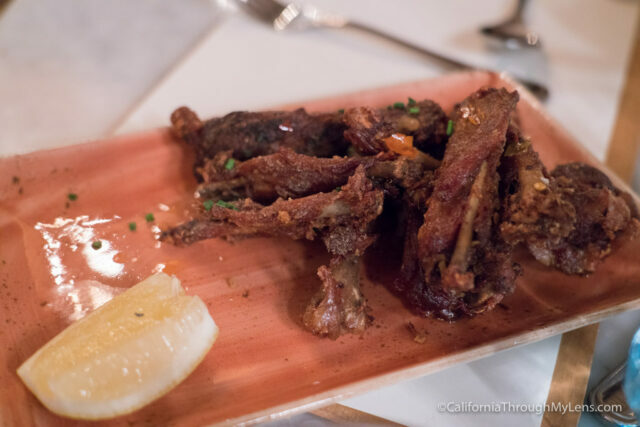 Duck Wings – This was my favorite thing I ordered as the wings are full of flavor and had moist, easy to pick apart meat. It had a nice, salty taste, paired with chili oil and finished with a batter the provided a nice fried crunch. Octopus – I don’t have a picture of this dish so I added a photo of the cheese plate. The grilled octopus was prepared well so that it was soft and not chewy like it often can be. Served with avocado, cucumber, and cilantro, which are things I would have never thought to eat with octopus but which paired great. Another dish I would easily order again. 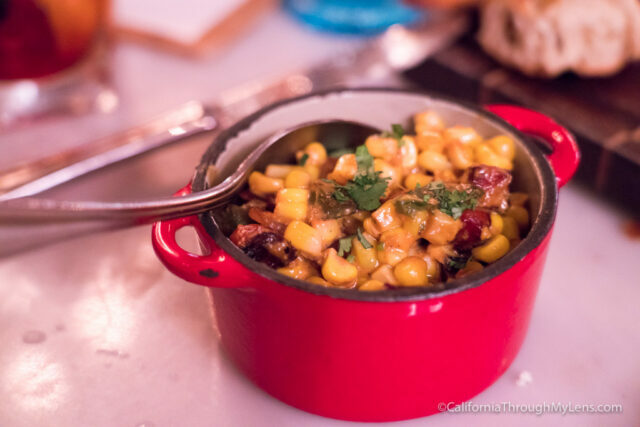 Corn – Served with chorizo and spices, this corn is fantastic. It’s spicy from the jalapenos but evened out with the mayo flavor from the corn crema, like what you would find in Mexican street corn. Honestly, I would order multiple of this dish as it was excellent. 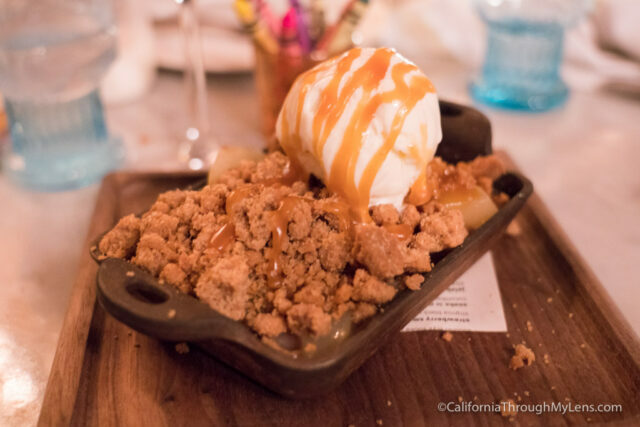 Brown Butter Pear Crumble – The dish consisted of sizeable spiced ginger streusel pieces on top of the roasted pear middle, flavored with cranberry jam and cream cheese ice cream. Great dish to share if you are in the mood for something sweet and it has a fantastic flavor. As you can no doubt tell I really like Searsucker. 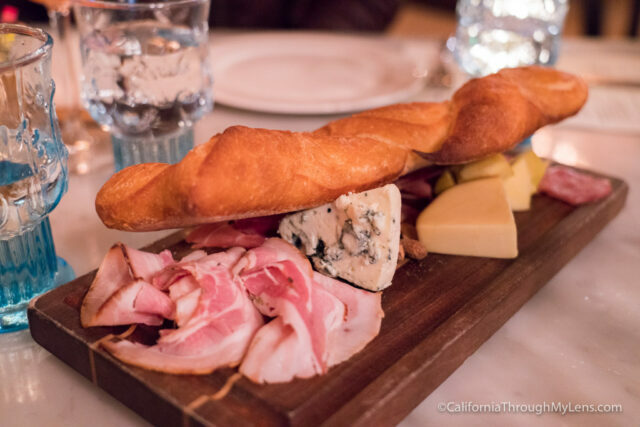 The unique dishes and fun atmosphere is a great find in the heart of Gaslamp for a fancy dinner. Check it out and let me know what you think in the comments.